I live in Switzerland, and here is a picture of Jennifer Chalbaud in Venezuela, holding a picture of my Gonzo Art painting. The internet is a fine and fabulous thing, but I grew up writing things with a pen, and that’s sometimes the best way to send a message. This isn’t always the case, my hand-writing can be horrible and near impossible to read. However, if I take my time the writing is coherent. Sometimes I’ll write a letter on the computer and then write it out by hand to send. In the instant message update world of Facebook and Twitter, I think it’s important to write by hand sometimes. Just like I think it’s important to sometimes paint with real brushes instead of only with the virtual ones in Photoshop. Words are sometimes more meaningful when you know that someone took the time to write them specifically just for you. Sharing words on Facebook and Twitter is fine, it’s fun to do and sometimes contributes to the over-throw of governments. Sharing written words is a dying form of communication, but it’s far more likely that you’ll be able to read a written letter you’ve saved in twenty years than find the random Tweets you’ve sent. Sometime in the past I joined a website called Talenthouse.com and added some paintings to my portfolio. This was all fine and good, but then I applied to a Creative Invite competition, I won, and as a result spent a weekend in Copenhagen as a guest at Hotel Fox, doing paintings for (t)here magazine. This was an interesting time, but one of the cooler points of a place like Talenthouse, is that you meet interesting people you wouldn’t have met in any other way. 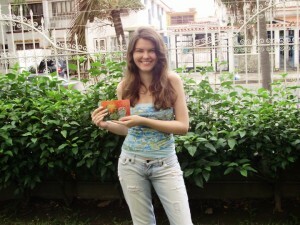 One such person is Jennifer Chalbaud, a fashion designer from Venezuela. Around Christmas time in 2010 I decided I needed to stop just using Facebook and Twitter to send messages and decided to step back in time and write some cards or letters. To be dramatic, I told people I was protesting the instant update. I decided it would be best to get some of my photos/paintings printed, so I got cards made at moo.com, my favorite place for such things. I had five images printed, including a Bratz doll, an image from my ProtestLove series, and Gonzo Art (my masterpiece to date), produced in Copenhagen. I figured it would be best to send cards to people who want them, and I posted an update to Facebook/Twitter asking if anyone wanted me to send them a card. One of those who responded was Jennifer. She said she liked my Gonzo Art image so naturally I sent her one of those. In the card I basically said that it’s been cool getting to know about her and her work, and that it’s great to get to know people who you feel inspired by. 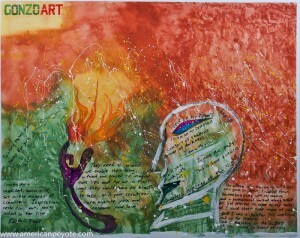 Eventually the Gonzo Art card worked its way through the global mail systems and ended up in her mailbox. Then Jennifer had a dream (this is how she described it). In her dream I was at a beach taking some portraits of a couple, and the couple had done some body paintings done in the style of my Gonzo Art. The idea for Gonzo Art was taken by me from from the writing style of the late Hunter S. Thompson, the idea being that the work is done fast and with a purpose. It should happen in the moment – without thinking, the hand writes what the mind perceives and it’s sent off to the printed without edits (of course, this never happened in reality). 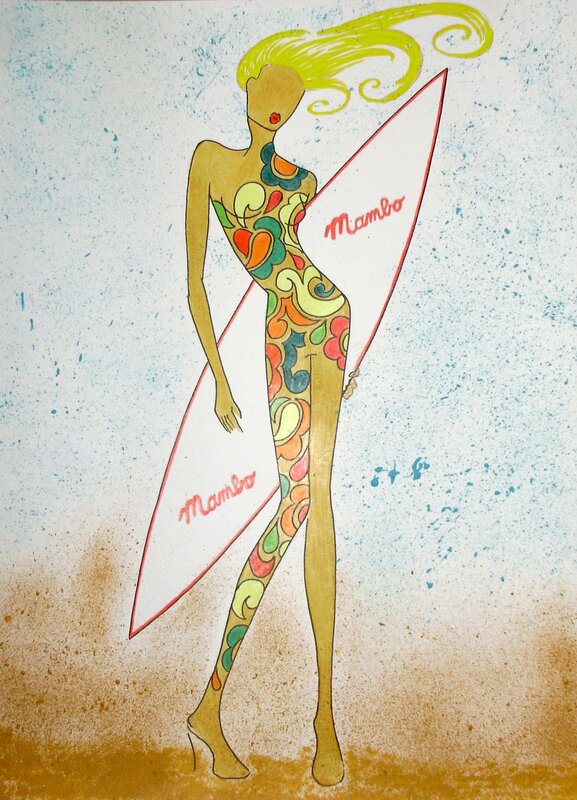 So, Jennifer followed that style for her inspiration and created a design for the Mambo Surfdeluxe contest on Facebook. I’m a trained scientist and I naturally like to look for patterns in life. Patterns give people a certain reassurance, a slight feeling of being able to sort of tell the future by understanding the rules of the World and the rhythms that operate in the universe. Other people prefer total chaos. One of the surest patterns I know in this life is that sharing leads to good things. It worked when I was five and it works even better now. I shared my art on Talenthouse and had an awesome experience painting in Copenhagen. 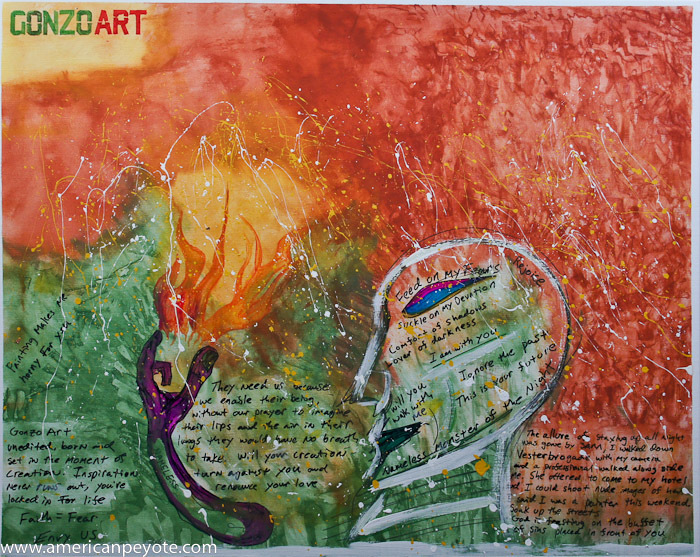 I shared some thoughts with Jennifer and sent her an image of my art and she was inspired to create something new of her own. She has shared this creation on the Mambo Surfdeluxe Facebook page, and it has been viewed by a number of different people, and I wonder what they have been inspired to do. Be inspired, create, share, repeat. Hey Mark! Thank you so much for taking a time to write about your fans! 🙂 Here was 3 am I couldn't sleep and turned on the computer then I saw on twitter you posted this , I like a lot! It's many times interesting the way you write I read it many times and now my eyes sting. You guys, this is amazing. All of the doubters need to read this to start BELIEVING!! Love it!